I'm such a sucker for fall. Pumpkins, maple syrup, nuts, pumpkins, vanilla, nutmeg, apples, pears, cinnamon...did i mention the pumpkins? Then there are the changing colors of the leaves and those crisp sunny days with a slight chill filling the air. I totally pine for all those romantic fall activities - pumpkin patches and apple orchards, hay rides and corn mazes. So, it is ironic. Hmm, I don't think ironic is right, unless we are talking about the Alanis Morissette definition of ironic. But it is a wonderful cosmic life coincidence that I now live in Southern California... where there is no autumn. Don't get me wrong, I really do love and appreciate the weather here, but every now and then, I long for fall, especially on hot, humid, summer days like today. So I bring fall home to me, imagining that there are deciduous trees outside my window - with leaves changing color and full of those brilliant shades of gold and red and orange instead of palm trees, and i surround myself with pumpkins and squashes and scents of cinnamon. I eat food that makes me think of fall. I recently had one of those days. My very own fall day created inside my head... and I ate this mac and cheese. It has an earthy, nutty taste with flecks of crisp orange carrots that just says fall to me. In a bowl, mix together the carrots and cauliflower and set aside. In another bowl, mix together the panko, flax seeds, and walnuts, and set aside. In a sauce pan, melt the butter over medium heat. Keep and eye on the butter, it will become foamy and brown specks will be at the bottom of the pan, and it will have a wonderful nutty fragrance. Be sure not to blacken the butter. Take the pan off the heat and whisk in the flour. Return the pan to medium heat. Once a roux has formed, stir in the milk, stirring frequently. Once that has thickened (about 8 minutes), stir in salt, mustard, and cheeses. Add in the macaroni and the vegetables. Heat oven to 350. Grease an 8x8 pan. Pour in the macaroni mixture. Top with the panko mixture. Bake for about 30 minutes, until the top is golden brown and the inside is bubbly. Serve with fresh parsley sprinkled on top. I'm loving all the vegetables in your recipe! I've been on the lookout for recipes like this one. Thanks for sharing! Btduds, Autumn is awesome in theory, but having to dig your car out of a pile of leaves nearly as tall as you are, not cool. What a fantastic looking mac 'n cheese! And so much better for you, too. I lived in So Cal for 16 years and I always missed fall. Now I live in Northern VA, and although I miss that great CA weather, I do love it when fall arrives! I love fall too - but I'm definitely in summer mode right now! Still, I'd eat mac and cheese any time of the year. I'm also a big fall lover. But I love summer, too and August is when we have all our fun summer plans. So I won't quite dream of autumn yet but I'll take a bowl of this mac & cheese anytime. I love browned butter but I've never used it in mac and cheese. I think I'll try this tonight! I love fall too. That macaroni cheese looks really good. Brown butter tastes amazing. Love fall as well and can't wait for it. This Mac 'n cheese sounds delicious. We will all be envious of that So-Cal weather this winter. This looks fantastic and I love all those veggies, what a great meatless meal. I live in Florida so don't see the fall either but we like to drive up toward Pennsylvania around mid October. Such beauty. Fall is my favorite season! I am so ready to get away from the oppressive heat and enjoy the beautiful produce and the changing colors. This sounds so delicious. 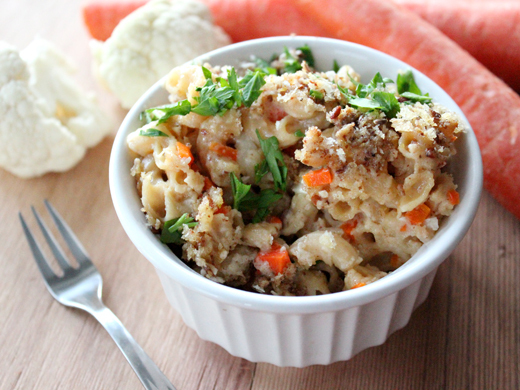 Love the brown butter in this!The addition of cauliflower and carrots is also a great idea :)Can imagine the deliciousness in every bite!! Seriously...how did I not think of this before? Brown butter in mac & cheese is so smart! Plus I love all the other delicious add-ins like carrots & walnuts. Ooooooh my goodness. Brown butter plus mac & cheese! What a combo! Divine! Hahah, I'm a sucker for pumpkins too. Fall flavors make me smile. This looks delicious though! It's been SO long since I've made macaroni and cheese, I really need to try it again! I seriously could not survive without autumn, although it's all of two weeks long in Alaska. This macaroni looks yummy--definitely several levels about Kraft! Wow. That looks delicious! Brown butter sounds fantastic in macaroni and cheese. I am LOVING the walnuts and cauliflower in here...what an unexpected but delicious twist! This looks amazing! 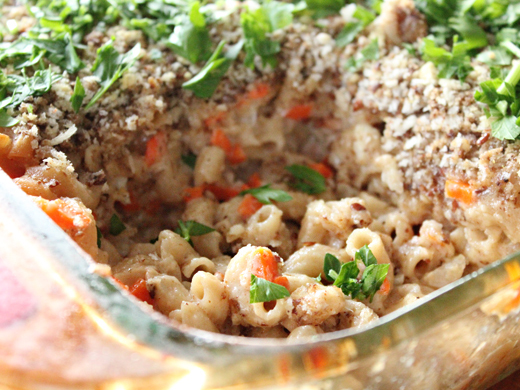 Hearty and comforting, and I love how you snuck the veggies in! brown butter makes my heart sing! i use it to bake all the time but this is such a fabulous idea! Mac cheese with brown butter...that sounds just heavenly! Now I'm even more anxious for fall!! This mac n cheese ROCKS! I love the extra veggies and flax seed, wow! Just when I thought mac and cheese couldn't get any better! The addition of brown butter sounds divine! Love the brown butter....and the veggies... this is such a lovely way to eat veggies! I usually follow Chef John's (from food wishes) macaroni and cheese recipe with nutmeg....this sounds delicious, sply the brown butter bit.... bookmarking the recipe!